In 2014 the Seattle Mariners notched 87 wins, their highest total since 2009. It marked a 16 game improvement on the previous season. Still, the Mariners were unable to end their playoff drought, which has continued since they won an MLB record 116 games in 2001. Going into 2015, the Mariners look like the favorites in the American League West. The Mariners aren’t short on star power. With Robinson Cano, Felix Hernandez and Kyle Seager, they own three of the top players in the division and all of baseball. Cano, who was signed to a whopping 1o year, $240 million deal last offseason, got off to a slow start. Yet, by the end of the year he produced his usual excellent numbers. 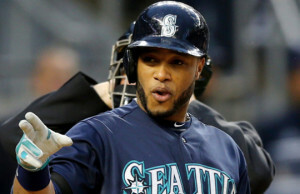 Though he hit just 14 home runs, Cano owned a .314/.382/.454 slash line with 5.2 fWAR. The 32 year-old second baseman projects for very similar numbers in 2015. He’s the top second baseman in baseball. King Felix posted the lowest ERA of his career in 2014. He hurled 236 innings and authored a 2.14 ERA with strikeout and walk rates of 27.2 percent and 5.0 percent, respectively. Opposing hitters batted just .197 against Hernandez. The 28 year-old has been the picture of durability throughout his career. Seager, who signed a seven year contract extension worth $100 million this offseason, broke out in 2014. He smashed a career-best 25 home runs and batted .268/.334/.454. Combine that with solid third base defense and he very quietly produced 5.5 fWAR. At 27, he should be a fixture on the Mariners for years to come. Seager doesn’t have the pedigree or reputation that Cano does, but he’s nearly as valuable to the Mariners. The M’s appear to have more depth than last year when they started the likes of Endy Chavez, James Jones, Stefen Romero and Abraham Almonte in the outfield. In addition, expect them to get much better production out of the designated hitter spot than they saw from Corey Hart and Kendrys Morales. Nelson Cruz, who was signed to a four year, $57 million deal this offseason, will get the bulk of the playing time at DH. The Mariners paid dearly for Cruz, who was coming off a career year with the Baltimore Orioles, but he’s an upgrade. Dustin Ackley, Austin Jackson and the newly-acquired Seth Smith will compose the M’s outfield. Young catcher Mike Zunino flashed power and good defensive ability in his first season behind the plate. The M’s rotation could be shaky behind Hernandez. Hisashi Iwakuma has been very good in his three major league seasons, but the oft-injured James Paxton who has thrown all of 98 big league innings projects as the No. 3. Journeyman J.A. Happ and second year man Roenis Elias round out the rotation. Prospect Taijuan Walker could see time if his shoulder and command issues get straightened out. Like every other team, the Mariners are not without holes. However, they should be considered the favorites in the AL West. The Oakland Athletics should not be counted out, but after making a bevy of trades this offseason, they’ve done a partial rebuild that leaves them a little weaker for 2015. The Los Angeles Angels have a strong group of position players led by Mike Trout, but their rotation has several holes and ace Garrett Richards won’t be available for Opening Day. The Texas Rangers will be better than their injury-plagued 2014 season, but they’re not serious contenders and the Houston Astros are still in the rebuilding process. 2015 could be the year the Mariners end their playoff drought. This team has star players. Their undoing was a lack of serviceable options in the outfield in 2014. They’ve taken steps to address that problem this offseason.